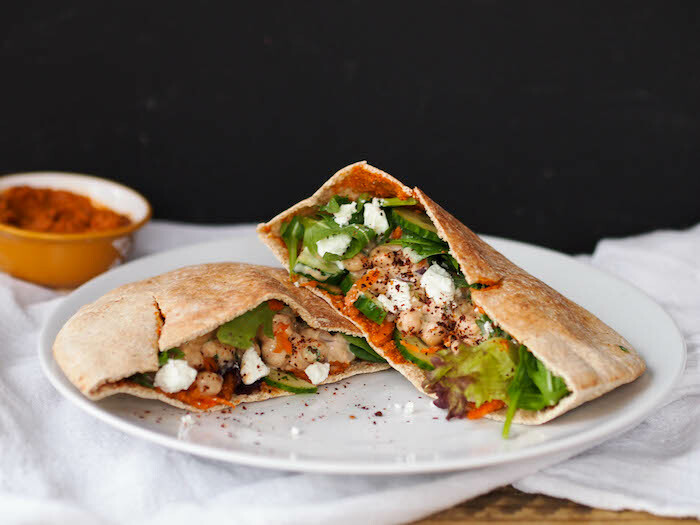 This whole grain pita with yogurt chickpeas and muhammara is packed with fresh Middle Eastern flavors! Don't get me wrong. I love hummus. But sometimes it's necessary to switch things up. A few months ago, I stumbled on muhammara at Trader Joe's. I'd seen recipes for the Middle Eastern red pepper and walnut dip, but never tried it. It's deep red color and pretty package were calling me, so in my cart it went! Holy smokes guys. Go out and grab some muhammara immediately! It's got a rich, deep and slightly smoky flavor that's enhanced with a bit of tart sweetness from pomegranate molasses. Spread on a piece of warm whole grain pita, it's pretty much perfect. Actually, I take that back. Spooned into a warm whole grain pita along with creamy chickpeas with yogurt and crunchy vegetables, now that's perfect! If you're packing this for lunch, you might want to pack the chickpeas and yogurt separately because the yogurt might make the pita soggy. The pita and muhammara would also make a great base for my green falafel or bulgur and lamb kofte. If you don't have a Trader Joe's or other store that sells muhammara, this recipe from The New York Times looks pretty simple. In a large bowl, mix together chickpeas and red onion, Add yogurt, dijon, parsley, lemon juice, zest, and smoked paprika. Season with salt and pepper to taste. Warm pitas in a toaster until lightly toasted, or microwave 20 seconds. Cut pitas in half and open each half to make a pocket. Spoon 2 tablespoons muhammara into each pita half and spread evenly. Stuff with salad greens, carrot, cucumber and spoon in 1/8th of the chickpea mixture. Sprinkle in goat cheese and serve.